Iraqi journalist Muntadar al-Zaidi throws a shoe at President Bush during a new conference with Iraq Prime Minister Nouri al-Maliki in Baghdad last December. The Iraqi reporter who threw a shoe at former President Bush last year has been released from a Baghdad prison, where he says he was tortured. Muntadar al-Zaidi, who served nine months in jail after firing footwear at Bush in a cultural show of disdain last December, demanded an apology and said he plans to name the "senior officials" who he claims tortured him while he was held. 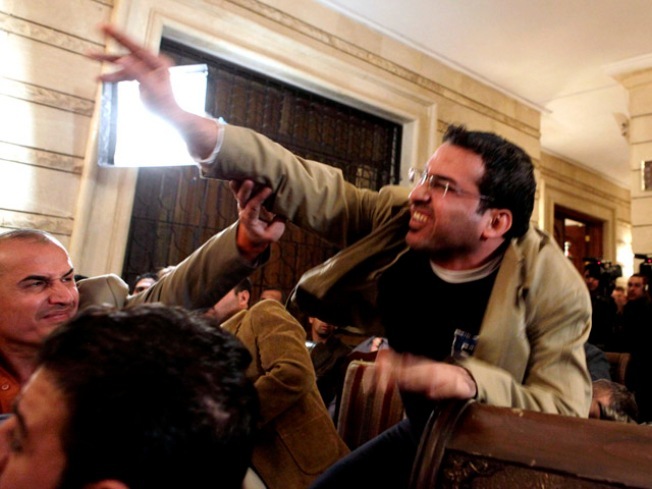 The shoe toss, which came at a joint press conference between Bush and Iraq'i Prime Minister Nouri Maliki, made al-Zaidi a hero for many Arabs, but some Iraqis were offended at a gesture they consider unforgivably rude. "This is a goodbye kiss from the Iraqi people, dog," al-Zaidi shouted at Bush, who ducked the shoe. "This is from the widows, the orphans and those who were killed in Iraq." Al-Zaidi was convicted of assaulting a foreign leader and initially sentenced to three years in jail. The term was reduced to 12 months on appeal and al-Zaidi was released three months early for good behavior. After his release on Tuesday, al-Zaidi said he had suffered beatings, whippings, electric shocks and simulated drowning at the hands of officials and guards. After the incident, Bush brushed it off, calling it "amusing," and "one of the weirdest" things he'd seen in his two terms as president.